Start your St. Lucia waiting off by escaping to an exotic location on island e – both on and off the resort. 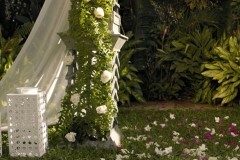 Exchange your vows under a bamboo canopy in a unique setting, lit by wrought-iron antique lamps and votive candles. 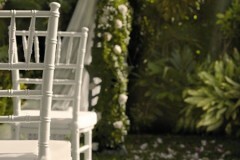 This premium wedding option features a purple, lemon and lilac orchid bouquet. 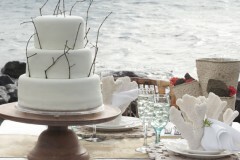 Consult your personal wedding at the resort to add personal touches that will make your celebration unforgettable. Start your wedding in St. Lucia off right by sampling exotic Middle Eastern hors-d’œuvre and toast to your happiness with Laurent Perrier champagne in the company of your most cherished friends and family. Imagine you are dining like Lawrence of Arabia, surrounded by lush carpets and ottomans, and sampling delicacies from the lands of the Thousand and One Nights with your closest and dearest. It’s simply magical, and might be the only way to enjoy dinner in St. Lucia. Celebrate your new life together by stealing a little bit of alone time. 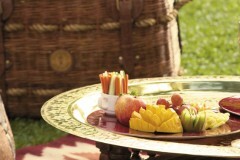 Your wedding planner at the resort will have a romantic picnic set up, just for two. Enjoy every part of your day together. Enjoy a side-by-side soothing, full-body massage for you and your loved one. 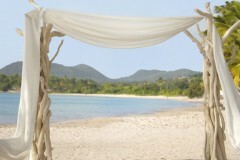 Alone at last – your wedding in St. Lucia comes to an end and the honeymoon can begin. 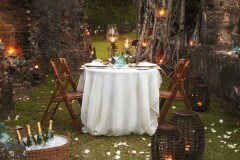 Start by enjoying a romantic dinner for two underneath the skies of St. Lucia. 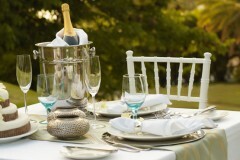 Whether its on the beach, in the resort’s garden, or in a gazebo, your wedding planner at the BodyHoliday resort will help you to create your own private dining experience. For more information, please feel free to use the form to the right and contact the Weddings and Events Department directly!